Friday 24th' off to Leenaun again for the now Annual 'A' team assault on the Connemara Mountains.This years goal, Glen Cogan, Glen Corbett horseshoes, Failmore Circuit with Ben Gorm/Ben Creggan as back up. Forecast looked good leading up to the weekend and again Connemara showed it has no regard for forecasts. Saturday, ready to climb at 09:30h. Cloud lifting to give a clear view of the Majestic Glen Cogan, things looking good,so on and up. About 300m the first of the gales hit; maps, hats ect. took off on their merry way which led to a mad scramble to recover same. Navagation easy enough at this stage but it was not to last. Wind increasing to storm force with heavy rain (should have listened to Mels weather warnings...) Makes one wonder what the 12 Bens Challange must have been like! No takers for the escape route at the half way point so on to the finish. The 7 hours extended to a 9 hour exhausting battle against the elements, but what a day! Sundays forecast even worse so even plan B went out the window. 80k winds so low level with no dissenters. 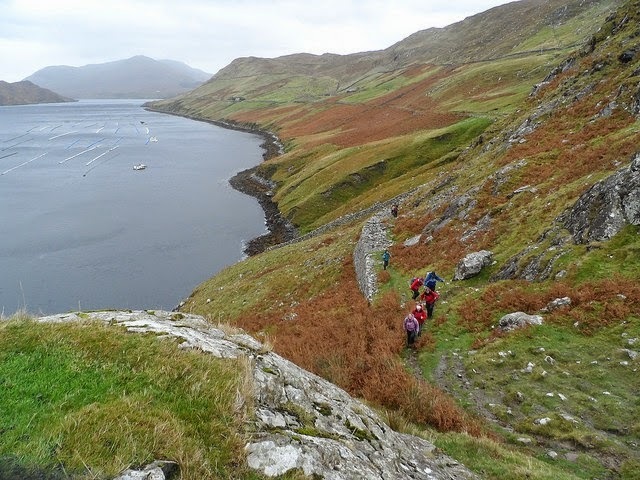 A long walk on the shore of Irelands only Fjord out to The Quay with a little bit of Ascent for good measure. The beauty of Killary Harbour is something to behold (pity about the mussel farms) Paid our usual visit to Ganeys, The Field pub, followed by a musical evening in the Hotel. A wonderful local artist Mary Keane pulled out all the stops, so good ,as John J said, even he stayed to the finish. Good also of Rosemary to entertain TONY!!! Only Monday to go, again the forecast looked good...it did yeah! Rain and wind again belting down, for the second year running the Glen Corbett mission had to be abandoned after a few hours. Next Year??. Wrapped up the weekend with dinner in Morans on the Weir. Well done to all for the effort put in in the most adverse weather conditions. No looking back after that.